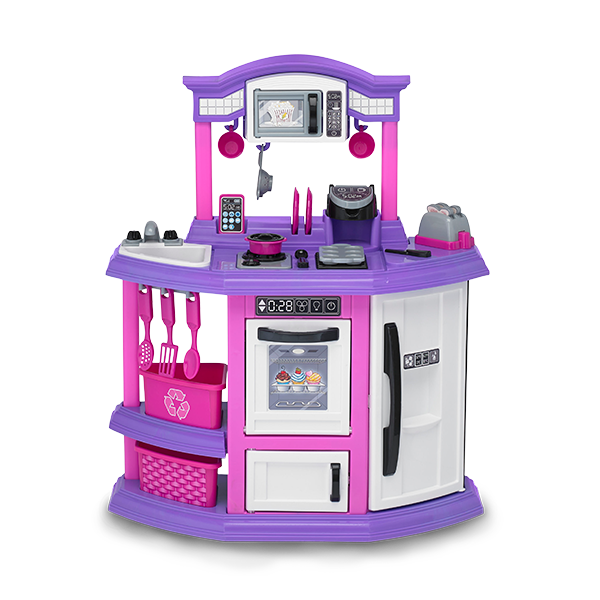 BAKER'S KITCHEN | American Plastic Toys Inc.
Little chefs will start baking right away with this 2015 National Parenting Center's Seal of Approval Winner and 2015 Parents' Choice Award Winner kitchen! It features the latest in realistic kitchen design, including a single-cup coffee machine, a burner, microwave, refrigerator, oven, toaster, and recycling and play bins. Accessories include two sets of plates, cups, forks, knives and spoons, two pieces of toast, muffin tin, pan with lid, touch screen phone, spatula, large spoon, strainer spoon, and strainer. For easy assembly, this kitchen can simply be snapped and pressed into place.